Design a Tea : Fund Raising with tea! Tea is the second most consumed beverage in the world. Specialty or artisan teas are in a growth phase that hasn't been seen in the consumer market since the diet drink battles of years past. Look at the explosion of tea companies and products in the major supermarket chains. Whether it is the health benefits or the focus on the "appreciation" of tea, it's a growing industry and is a great unique fund raising product to offer your community! Healthy - Tea is full of antioxidants and some of our teas are even caffeine free. We buy our teas from ETP suppliers - The Ethical Tea Partnership is an initiative started within the tea industry to monitor and regulate the living and working conditions on tea estates. The organization is run and regulated by member companies and bolstered by regular external audits by Price Waterhouse Cooper. Exceptional Customer Service - We take pride in knowing we are a small part of your organizations' event. And we go out of our way to show it. Personalized service with product design, hand blending and an eye for detail sets us apart from the mass product fundraising programs. Choice - We have a simple mission, to bring "choice" back to the consumer. 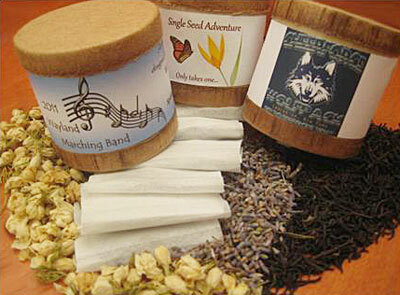 We offer flavoring and customized labeling such as the name of your school, organization or event at NO EXTRA CHARGE! Unique - For those people in your life that have everything . . . I'll bet they don't have a tea named after them. And it's a nice alternative to the candy, cookie dough and candle fundraising programs. DIRECT SALES: You take orders and collect the money directly from your supporters. You forward the order sheet to us - we'll ship all the filled orders back to you and invoice you $3.90 for each unit ordered. Suggested selling price of $6.50 for a profit of $2.60 each sale. That's a profit of 40%. No money upfront! WEB SITE SALES: You get the word out. Newsletters, blogs, posters, bulletins, however you can direct folks to our site, we'll do the rest. Instruct your customers to enter a word, or code that we have prearranged with you when they check out. We'll send 25% of the product total to your organization monthly. We will also take $1.50 off our flat shipping/handling charge so it'll be a flat $3.50 for the entire order!.